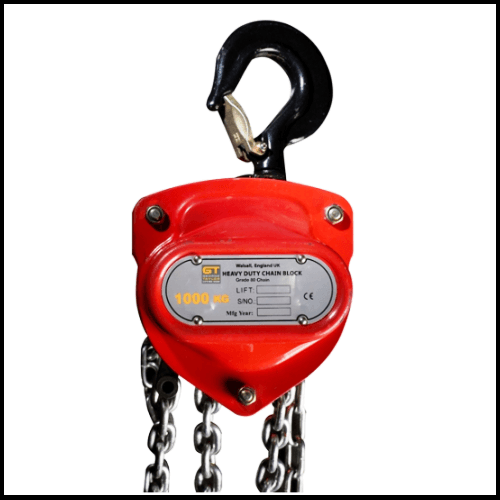 The Tried, tested and trusted GT Viper chain block is a heavy duty manual chain hoist. The models range in lifting capacities from 500kg / 5tonne up to 30000kg / 30tonne. 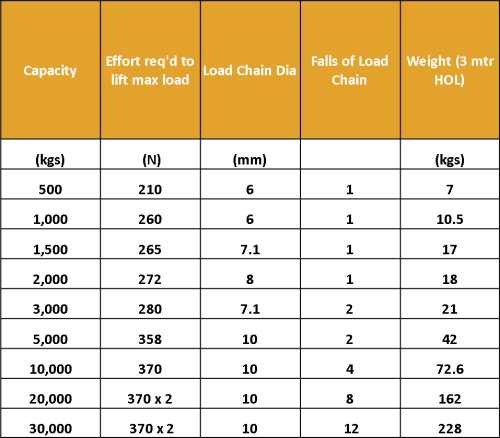 Due to the variation in safe working loads the models vary in the amount of load chain falls they possess. 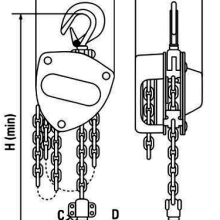 For models up to 2000kg they will have 1 fall of chain. 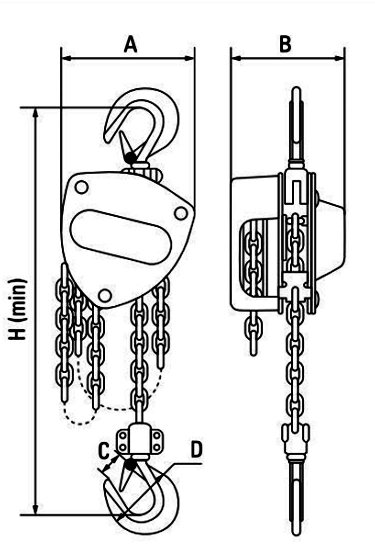 For chain blocks from 3000kg – 5000kg they will have 2 chain falls. 10000kg models have 4 falls of chain whilst the 20000kg has 8 falls. The largest 20000kg model has 12 falls of chain. The GT Viper chain hoist is manufactured with high quality materials to ensure excellent durability. The bearings are in sealed units to provide extra protection, however these and all other parts of the GT Viper chain block are replaceable for convenience. With most spares readily available, this gives the user total repair and servicing flexibility. This adds to the overall cost effectiveness of this product. The top and bottom swivel hooks incorporate heavy duty catches for additional safety. The load chain is in grade 80 and is calibrated and zinc plated. The hand chain is zinc plated. It should be noted that this chain block is not suitable for cross hauling at angles or fleeting. All GT Viper manual chain blocks come with a 1 year limited warranty. A hand book full of do’s and don’ts, maintenance tips, trouble shooting tips, safety tips and a spare parts list is included for your convenience. The booklet should always be read fully by the intended user prior to use. This is to familiarise him/her self with the product as well; as potential hazards to avoid, quick inspection tips and looking after the equipment. A few minutes of reading to begin with could end up saving a lot of time, money, and even save lives later on. Always visually inspect your chain block prior to each use, check for chain damage, and hook issues such as damaged safety catches and always check the brake for slippage when loaded. If any wear, tear, damage, distortions, bends, cracks etc are noticed the chain block must not be used and taken out of service until professionally checked over and issues rectified; REMEMBER – if in doubt – DON’T. The GT Viper chain hoist should be thoroughly inspected by a competent person twice a year with all checks and issues documented; these documents must be kept in your records as will be needed if health and safety come calling. Lifting Hoists Direct can offer a full hoist service, inspection and repair service for complete peace of mind. Use chain as a sling.
" GT Viper dimensions PDF "